A wild plant from La Huasteca, in Monterrey, Nuevo Leon. 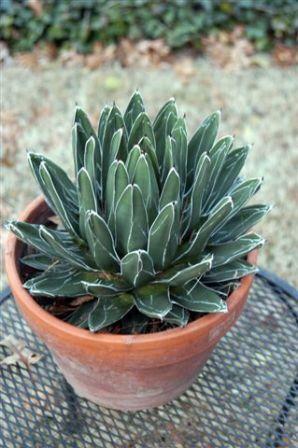 Habit: Beautiful, very slow growing but tough agave that forms individual slow growing, dense rosettes. Most plants are solitary, but some offset heavily. Leaves are short, rigid and thick, trigonous, dark green, and beautifully marked with brilliant white-margins. The distinct longitudinal white markings are unique, slightly raised, like mini-variegation bordering each leaf. They are toothless, with only a short black, terminal spine. Leaves grow close together and are arranged in regular rosettes. The summer blooming flower takes the form of a spike, from 6 - 12 feet high, containing many paired flowers of various colors, often with shades of purple red. As with all types of agave it has a long life cycle and sets flowers after approximately 20 to 30 years of vegetative growth, and the effort to produce the flowers exhausts the plant that dies within a short time. Culture: Plant in full sun with extremely well drained soil. Very easy to grow with a few pest problems. Stupid people carving their initials into the leaves is the most common problem. Hardy to 12 degrees F. Origin - Mexico. Uses: These plants were discovered by the Spaniards in the 17th century where the local Indians used them for fibers, food and to make an alcoholic drink like Tequila. The fibers were used to make clothing and ropes. Most of the plant was used for food, raw and cooked. Flowering stems and flowers are edible and were roasted or boiled. Excellent for the cactus gardens or in pots. Note: It is extremely variable with the very open black-edged form sporting a distinct name (King Ferdinand's agave, Agave ferdinandi-regis) and several forms that are the more common white-edged form. Several cultivars have been named with different patterns of white leaf markings or no white markings (var. viridis). Be careful. It is highly armed.